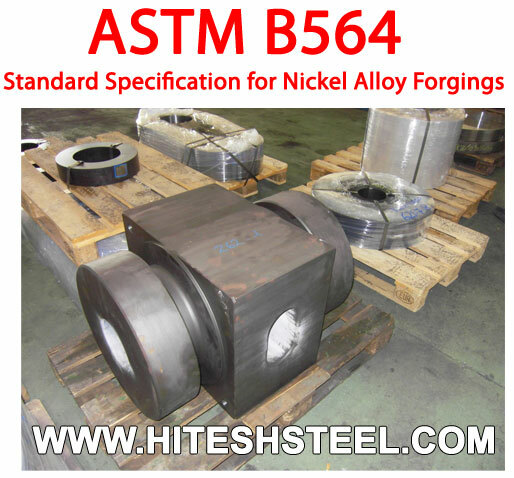 ASTM B564 specification covers nickel alloy forgings. These alloys are classified into different grades according to their chemical composition. A chemical analysis shall be employed on each alloy in order to determine its chemical composition. Grain size and mechanical properties like tensile strength, yield strength, and elongation shall be measured. A tension test and nondestructive ultrasonic test shall be done on each specimen. Hitesh Steel has years' of experience working in the following grades of ASTM B564 nickel alloy material. We are able to drop forge almost every type and grade of nickel alloy material available on the common market. Please contact us today with your specific requirements. The nickel-iron-chromium alloys are UNS N08120, UNS N08800, UNS N08810, and UNS N08811. Alloy UNS N08800 is normally employed in service temperatures up to and including 1100°F (593°C). Alloys UNS N08810, N08120, and UNS N08811 are normally employed in service temperatures above 1100°F (593°C) where resistance to creep and rupture is required, and are annealed to develop controlled grain size for optimum properties in this temperature range.